As someone who deals with academic press releases on a frequent basis, I have to sympathize with journal and university press offices. They have to put together a press release that's attention grabbing enough to pique the interest of writers, is clear enough to explain the concepts to the untrained, but doesn't lose the science in the shuffle. Sometimes it works, and sometimes...not so much. The paper itself is the much more prosaically titled "Identiﬁcation of the Binding Site of Brucella VirB8 Interaction Inhibitors" and discusses a way of making drug-resistant bacteria susceptible to the body's immune system. This leads to a metaphor extended to Stretch-Armstrong-like proportions. "To understand this strategy one could imagine harmful bacteria being like Darth Vader, and the anti-virulence drug would take away his armor and lightsaber," explained Dr. Christian Baron, the study's lead author and Professor at the Department of Biochemistry. "A naked Darth Vader would be an easy target and similarly, pathogenic bacteria without their virulence factors would be rendered harmless and eliminated by our immune system." "As if we were pulling on a loose thread in Darth Vader's cape, we have found a way to unravel the molecular details of the binding of these molecules to a target protein known as VirB8, a key part of the virulence mechanism of human and animal pathogenic Brucella species of bacteria," Baron explained. The science behind this is actually pretty cool — a way of rendering bacteria harmless and susceptible to a natural defense. But likening that to stripping Darth Vader naked? Well, it certainly got our attention. And for further weirdness from the annals of university press releases, see these space dinosaurs and the kraken self-portrait. 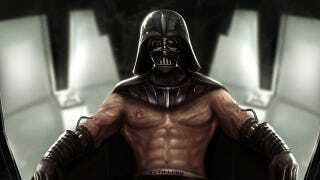 Who wants to see a mostly naked, grotesquely jacked Darth Vader?